For those struggling with conditions like depression, anxiety, and substance abuse, Balance provides a confidential pathway to comprehensive, accessible resources and services. Your Path to Emotional Health. For 130 years, Johns Hopkins Hospital has led the way in both biomedical discovery and health care, establishing the standard by which others follow and build upon. This is one of many faculty-developed programs, protocols and services provided by Johns Hopkins HealthCare Solutions to improve health outcomes and reduce the cost of care. At Johns Hopkins, we know it takes a team to provide great care. 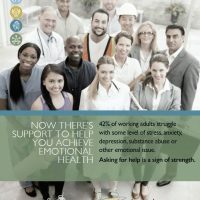 20% – 30% of employees and their dependents struggle with an emotional health condition such as stress, depression and substance abuse. 30% – 40% of the U.S. population experiences emotional health and substance misuse disorders at some point. 50% of these individuals require professional care. Only 40% of adults who have an emotional health condition reported receiving any sort of service for their condition in the prior 12 months. 10% of workers are classified as heavy alcohol users. Emotional health conditions and substance abuse frequently co-occur with chronic medical conditions like diabetes, which can double if not triple an individual’s health care costs. 60% – 80% of workplace accidents are attributed to stress, and it’s estimated that more than 80% of doctor visits are due to stress. $811 per month – the average cost of treating a person with diabetes (w/out complications). $1,775 per month – the average when that person has a serious and persisting emotional health condition. $1,848 per month – the average cost for that person with co-morbid substance use disorders. 500 million – estimated workdays lost annually due to alcohol abuse. 2x as likely – employees who use drugs are twice as likely to request early dismissal or time off. 2.5x as likely – employees who use drugs are two and half times more likely to have 8 or more absence days. $2.5 trillion – estimated cost of emotional health conditions globally. Unlike costly physical illnesses like cancer, where expenses are largely hospital-based, emotional health costs are often indirect, such as not being able to work. More days of work loss and work impairment are caused by emotional health conditions than by other chronic health conditions, including arthritis, asthma, back pain, diabetes, hypertension and heart disease. Emotional health issues can account for 30% or more of the disability burden for the typical employer. 53% of employers found that return to work is more difficult for employees suffering from psychiatric disorders than for general medical disability. 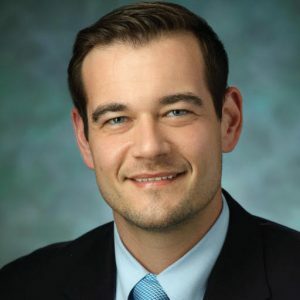 Matthew E. Peters, M.D., is an assistant professor at the Johns Hopkins University School of Medicine with appointments in the Department of Psychiatry and Behavioral Sciences and the Department of Neurology. He completed a neuropsychiatry fellowship and has an active clinical practice and research group focused on cognitive and other psychiatry symptoms following brain injury. He has a particular interest in symptom occurrence in older adults and the underlying brain circuitry involved. Dr. Paul Kim is an assistant professor of psychiatry and behavioral sciences at the Johns Hopkins University School of Medicine. He serves as attending physician on the Young Adult Inpatient Unit and Mood Consultation Clinic at the Johns Hopkins Hospital. He also conducts basic science research studying the role of neuroinflammation and neurodevelopment in neurological and psychiatric disorders. He is a managing editor of and contributor to the Johns Hopkins POC-IT Psychiatry Guide. Emotional health problems are common in people with health conditions such as heart disease, diabetes, muscle and breathing problems. Stress can increase your chances of getting certain types of cancer and heart disease. Depression has been linked to several common health issues, including heart disease, type 1 and 2 diabetes, obesity and asthma. Psychosocial factors—such as work environment and whether you’re married—play a key role in high blood pressure. ADHD and depression have been associated with obesity. Stress and anxiety are more likely to keep you home from work than a cold or stomach bug. It’s going to be tough to do your job if you’re feeling down or blue. Depression causes people to function at lower level—at only 70 percent of peak performance. Stress can cause job dissatisfaction and increase job turnover. People often wait years before seeking treatment and suffer needlessly. Often this is due to the stigma around mental health issues. But it doesn’t have to be that way. *Balance is a Johns Hopkins Medicine worksite program in collaboration with mdLogix and BHS. This service is confidential and follows all federal and state privacy laws. When speaking to a Care Concierge, the conversations and information collected is not shared with the employer. Clicks on the topics below to learn more about these topics. Everyone experiences stress in daily life. And, the very real effects of stress impact our overall health and wellness in a number of ways that can affect every system of our bodies—from the heart and cardiovascular system to the digestive system. Stress can negatively affect sleep, our moods, and even interfere with relationships and our jobs. Symptoms of stress include a wide range of physical issues, everything from headaches, heartburn and insomnia to increased colds and infections. And while it’s important to remember that everyone experiences stress as part of life, it’s also important to know that help in dealing with stress is available. Take direct action to solve the problem. First, identify the problem, then consider possible solutions and evaluate the pros and cons of each. This will help you determine the best course of action. Get regular exercise. In general, moderate levels of physical activity help relieve stress—aim for 30 minutes a day of moderate-intensity exercise (such as brisk walking) at least 5 days a week. Get enough sleep. When stressed, some people have trouble sleeping. Remember that exercise during the day can help with insomnia. Making a list may also help, or try writing down your thoughts about what’s troubling you early in the evening, then keep activities prior to bedtime restful and relaxing. Practice relaxation techniques. These include such things as deep breathing, meditation, and listening to soft, soothing music. Experiment with these and find what’s best for you. Make time for fun. Sports, hobbies, and socializing offer ways to unwind. Try something new and see which activities appeal to you most. Everyone has their ups and downs in life. That’s only natural. But clinical depression is different from the occasional bout of feeling down. If you are clinically depressed, your sadness will be profound for weeks at a time, almost without relief. Do you feel deeply sad or hopeless most of the day? Are you much less interested in things that used to interest you? Do you have trouble paying attention or concentrating? Do you feel guilty and bad about yourself? Do you think you’d be better off dead? Do you think about hurting or killing yourself? If you answered yes to more than one of these questions, or if you answered yes to the last two, you should talk to your doctor as soon as possible about how you are feeling. Depression can be treated with medication and psychological counseling. Even some lifestyle changes, such as diet and exercise, can help. And while it’s important to know that depression can be a serious disease, it’s also good to know that help is available. If your sleep is disturbed more than three times a week, and the trouble has gone on for at least a month, discuss it with your doctor; he or she might recommend a sleep specialist. 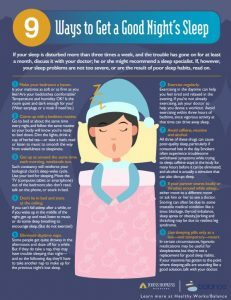 If, however, your sleep problems are not too severe, or are the result of poor sleep habits, read on. 1. Make your bedroom a haven. 2. Come up with a bedtime routine. Go to bed at about the same time every night, and follow the same routine so your body will know you’re ready to bed down. Dim the lights, drink a cup of herbal tea—or take a bath, read or listen to music to smooth the way from wakefulness to sleepiness. 3. Get up at around the same time each morning, weekends too. Such constancy will reinforce your biological clock’s sleep-wake cycle. Use your bed for sleeping. Move the TV (computer, tablet or smartphone) out of the bedroom; also don’t read, talk on the phone, or snack in bed. 4. Don’t lie in bed and stare at the ceiling. Some people get quite drowsy in the afternoons and doze off for a while. But if they do take a nap, they may have trouble sleeping that night—and so the following day, they’ll have to take another nap to make up for the previous night’s lost sleep. Exercising in the daytime can help you feel tired and relaxed in the evening. If you’re not already exercising, ask your doctor to help you devise a workout. Avoid exercising within three hours of bedtime, since vigorous activity at that time can drive away sleep. 7. Avoid caffeine, nicotine and alcohol. All three of these drugs can cause poor-quality sleep, particularly if consumed late in the day. Smokers often experience troublesome withdrawal symptoms while trying to sleep; caffeine stays in the body for many hours before it can be eliminated; and alcohol is actually a stimulant that can also disrupt sleep. 8. If your partner snores loudly or thrashes around while asleep . . .
either move to a different room or ask him or her to see a doctor. Snoring can often be due to some treatable medical condition like a sinus blockage, thyroid imbalance, sleep apnea or obesity. Jerking and thrashing may be due to restless leg syndrome. 9. Use sleeping pills only as a last—and temporary—resort. In certain circumstances, hypnotic medications may be useful for sleeplessness but they’re not a replacement for good sleep habits. If your insomnia has gotten to the point where sleeping pills are sounding like a good solution, talk with your doctor. This technique can result in both better emotional and physical health. Lie on your back to help shift your breathing to a deeper, abdominal breath. Hold that breath for a few seconds and then slowly exhale through your mouth. Try to imagine you’re exhaling through a straw. After that deep breath, take three or four normal breaths. Then take another deep breath. 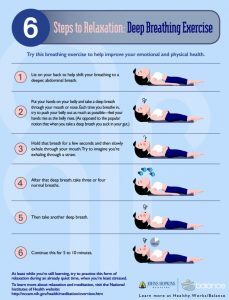 At least while you’re still learning, try to practice this form of relaxation during an already quiet time when you’re least stressed. To learn more about relaxation and meditation, visit the National Institutes of Health website: http://nccam.nih.gov/health/meditation/overview.htm. Regular exercise has effects that can boost mood, relieve depression and stress, and increase your self-esteem. Repetitive movements like those used in walking, running, swimming, or cycling increase production of serotonin (the chemical in the brain whose decline is linked to depression). You don’t have to be a marathon runner…all you need is a regular program of aerobic exercise. Regular exercise is an effective way to decrease blood levels of stress hormones such as cortisol. High levels of these hormones have been linked to depression and anxiety symptoms. Intense exercise triggers endorphins—“runners high” comes from the release of endorphins, which produces a sense of well-being and suppresses sensations of pain. Endorphin production usually begins about 15 to 20 minutes into an exercise session, and tends to peak after about 45 minutes.